An Amorphous Sushi box as Architectures Savior? Architecture has reached its limits! Intrigued (or driven to despair) by this quasi-prophetic summons, hordes of architecture students, architects, journalists and others descended on the catacombs of Columbia University in New York on February 28. 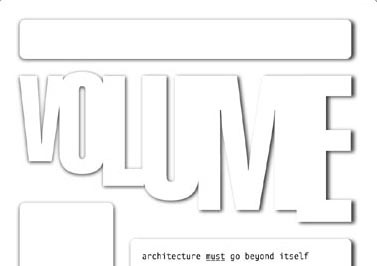 That was the venue for a press conference convened to introduce VOLUME, a two-monthly periodical initiated by Archis, AMO and CLAB (Columbia University), in collaboration with graphic designer Michael Rock, and scheduled for release shortly. After the presentations it was time to explain the VOLUME project. But the level of abstraction and vagueness surrounding both the content and the format of the periodical drew a lukewarm audience response and questions that were more practical and even sceptical in character. We were told that VOLUME can be both esoteric and populist, an amoeba-like project comparable in leverage to the World Bank. Koolhaas described the format as a sushi box with constantly changing contents, to which Michael Rock added that it would also feature repetitive elements because of the economics of the venture. After the questions, some of which disputed the integrity, both financial and conceptual, the initiators again stressed that VOLUME will be a positive project. VOLUME definitely has potential, and these questions will hopefully be answered from April on once the new periodical hits the shelves. According to the invitation, VOLUME will become: Magazine, Object, Space, Event, Debate, Webcast, Consultancy, Talkshow, Travel and Surprises. Brought together by the conviction that 'Architecture Must Go Beyond Itself', the three partners – the office (OMA/AMO), the school (CLAB) and the magazine (Archis) – explained how they had reached the limits of their potential, how they plan to set new limits, and how they plan to deploy VOLUME for that purpose. The press conference was a well-staged performance and wholly in harmony with the bleak message: Rem Koolhaas (OMA/AMO), Mark Wigley (CLAB/Columbia University GSAPP), and Ole Bouman (Archis editor in chief) outlined the sorry state of architecture today. To them it's clear that, in the current paradigm, architecture has reached its limits and must seek new forms of collaboration and modes of expression to stay its ground and remain a 'dangerous' and critical force. First off was Koolhaas, who explained how the current structure of the office means that the architect is constantly losing ground and becoming increasingly unimportant. A huge amount of knowledge is amassed in offices during a project, but once a project is finished, little is done to preserve that knowledge because of the lack of a suitable infrastructure. Moreover, the office often has no time or money for critical self-reflection. At OMA, this prompted the setting up of AMO. 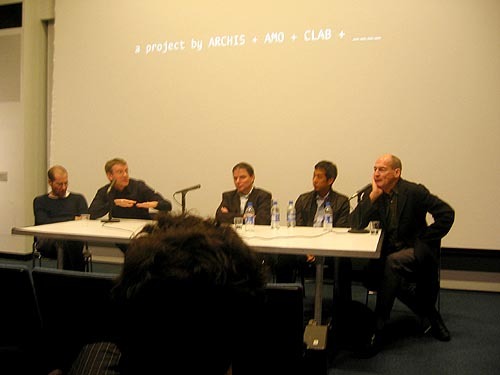 Koolhaas continued with his latest crusade: defending the rights of the 'Starchitect'. To him the 'starchitect' is benefiting too little from the growing market economy. A comparison of his Universal project with older projects like the Seagram Building and the Hong Kong Bank revealed that the architect's remuneration, in terms of percentage, has actually decreased! Koolhaas added that his 'star' status means he is no longer taken seriously outside his discipline, and he criticised the passive role of today's architect who has to wait for clients. AMO enables them to operate pro-actively. Mark Wigley, dean of Columbia's Graduate School of Architecture, Planning & Preservation (GSAPP), continued in rhetorical vein with the grim news of just how much new ground the school must break to justify its existence. After sketching the history of architectural education, Wigley referred to recent international agreements, signed by America, China and Europe, that are geared to protecting the discipline from the emergence of 'bad architecture'. These are in fact global contracts with self-imposed standards 'out of fear for itself'. The architectural education community world-wide, says Wigley, numbers around a million people. A community the size of a city, with similar features: hot spots, historical centres, outlying districts and so on. He advocated abolishing the 'star status' enjoyed by particular schools, among them the Columbia GSAPP, and setting up of an 'open source network' in which the huge volume of knowledge and networks of students world-wide could be harnessed to better effect, by VOLUME for example.